First-generation cardiac CT imaging techniques comprise simultaneous recording of the ECG signal combined with continuous low-pitch spiral scan acquisition with relatively high incident radiation dose. Because of the increasing number of cardiac CT studies and anticipated further growth, the contribution of cardiac CT to the radiation exposure of the population may not be negligible. With growing radiation dose awareness, a variety of different cardiac CT acquisition techniques have been developed over the past 15 years improving the dose efficiency of ECG-synchronized cardiac CT. Recent innovations have demonstrated that radiation dose at cardiac CT can be substantially reduced without detrimental effects on diagnostic image quality including single-heartbeat acquisitions, ECG-based tube current modulation, low tube voltage imaging, and advances in CT raw data reconstruction by means of iterative image reconstruction. New-generation CT scanners allow excellent image quality in the majority of cases and in a wider range of heart rates or rhythms. 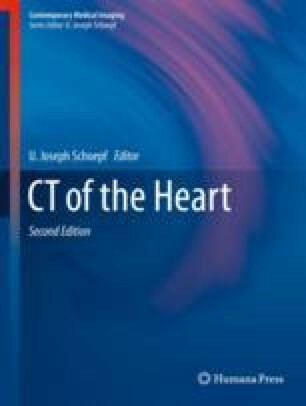 The aim of this chapter is to provide an overview on the various imaging acquisition techniques used in cardiac CT including the various concepts developed by the main CT vendors.